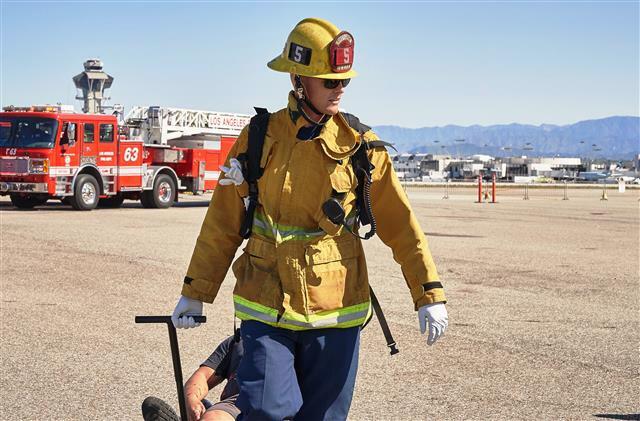 LAFD firefighters carry a person portraying an accident victim toward an ambulance during the 2019 AirEx exercise held at LAX on Wednesday. 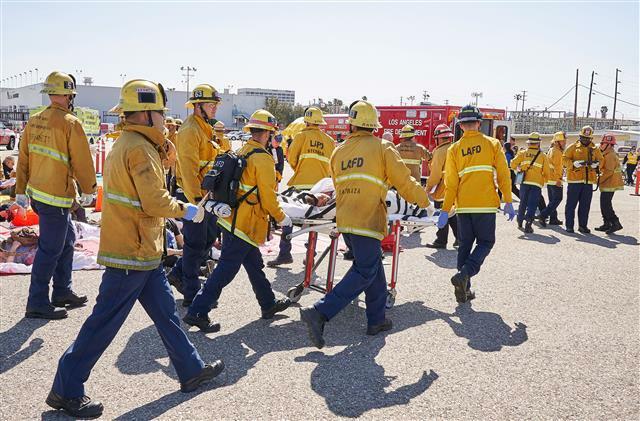 The objective of the exercise is to evaluate the operational capability and readiness of LAX’s incident management and emergency response system in a real-time environment in which people, equipment and materials are mobilized and deployed. The scenario for today's exercise was the emergency landing of an aircraft, followed by a fire. About 150 volunteers role-played accident victims, including many in moulage – special effects makeup applied to simulate injuries. The exercise was monitored by a number of professional evaluators, and nearly 300 observers were also on hand to learn from the large-sale training. This included observers representing 20 airlines and airport stakeholders, as well as representatives of the consulates of 13 nations, including the United Kingdom, Germany, Finland, Greece, Argentina, Austria, Australia, Malaysia, Bangladesh, Myanmar, Kenya, Canada and Brazil. In addition to the emergency response, the exercise tested LAWA's plans for support of victims of an aircraft disaster and the affected airline by expediting patient tracking and reunification of friends and family. For the first time, observers were also able to see how hospitals would process transported patients, set up family support and share information with LAX, the airline and federal agencies. The Federal Aviation Administration (FAA) requires the unrehearsed exercise to be conducted by Los Angeles World Airports (LAWA) at least once every three years. LAWA officials will use information gathered during the exercise to help further refine emergency response plans at LAX. Organizations represented at today’s exercise included LAWA, the Los Angeles Fire Department; the American Red Cross-Los Angeles Chapter; Los Angeles County Emergency Medical Services Department and Coroner’s Office; Federal Bureau of Investigation; FAA; Transportation Security Administration (TSA); U.S. Customs and Border Protection (CBP); Cedars Sinai, Kaiser Permanente and Southwest Airlines. Allegiant Air provided one of its Airbus A319 aircraft to use as a backdrop. 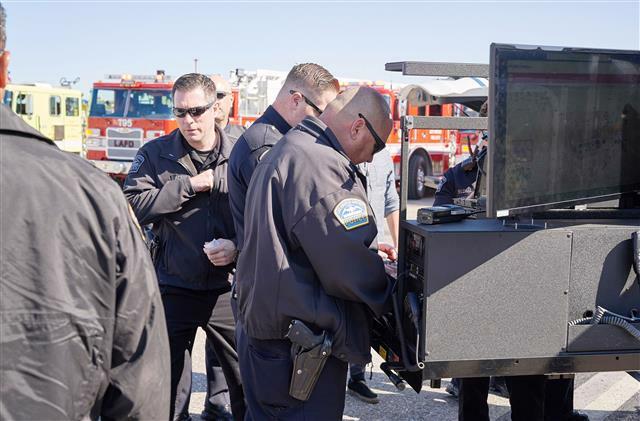 Los Angeles Airport Police work at the incident command post during Thursday's AirEx exercise.